Gujarat Chief Minister Vijay Rupani said BJP is confident that Patidar community is still with party. Gujarat Chief Minister Vijay Rupani on Sunday said that the Bharatiya Janata Party (BJP) is confident that the Patidar community is still with party and will support the ruling party in the upcoming Assembly elections, which is scheduled to be held before December 18 this year. 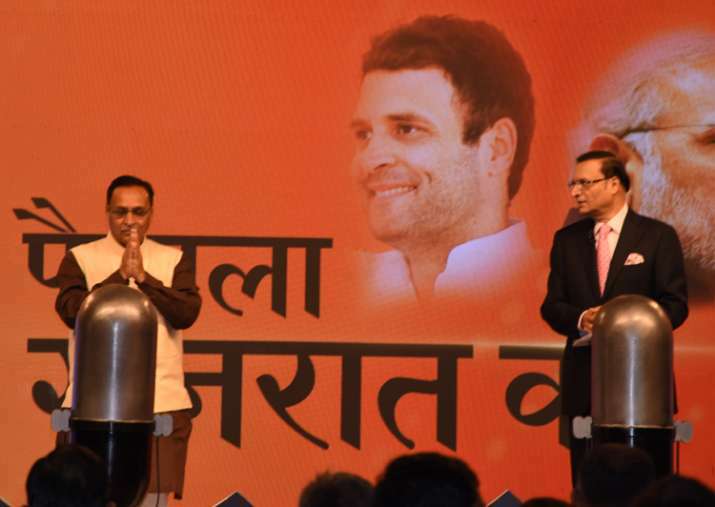 “Patidar was, is and will always be with the BJP,” Rupani said at India TV's mega conclave ‘Chunav Manch’ in Ahmedabad on Sunday. Talking to India TV Editor-in-Chief Rajat Sharama, Rupani said despite Patidar protests, the BJP has been successful in winning 80 percent of seats in panchayat polls in last one and half years. “We have not taken back cases to appease Patidars but people-friendly government means we have to find solution together. I can say with confidence that Patidar is still with BJP,” Rupani said. Rupani also weighed in on the recent alleged atrocities against Dalits and said that the BJP government is committed towards providing protection to all sections of society. He expressed confidence that the community will vote for the saffron party in the upcoming elections. “I am confident that Dalits will vote for the BJP because we have taken action in all cases of alleged atrocities. It is our responsibility to provide protection to all sections of society. Be it Dalits or any other community, we pledge to protect all and provide them with their basic rights,” the Chief Minister said. Attempting to assuage concerns of the traders community which is considered a vote bank of the BJP, Rupani said there have been some disruptions because of the GST but the Narendra Modi government at the Centre has tried to resolve all issues facing people. “Traders believe that GST is good for business and they have been asking for it for a long time. They understand that there are always issues when a new system comes in. PM Modi had said that he would review the GST in three months and he did so. He is doing everything to help people. In last GST Council meeting, the government took note of concerns of traders and came with solution,” the BJP leader said. Speaking on the recent criticism of the BJP government at the Centre that it pressured the Election Commission to not announce the poll dates for Gujarat because it wanted to woo the people with some last-minute sops, Rupani said his party does not interfere with the decisions made by the poll body. “We do not interfere with the decisions made by the Election Commission. We want Election Commission to work independently. It is the Election Commission's prerogative to declare date of election,” he said. Rupani said his government will continue to work and announce schemes until the last minute and that he is not concerned with the dates of election in Gujarat.